The Horizon Poker Network sites revealed that this one-off $5.50 buy-in tournament is to kick off on February 14 from 8:15pm New York time complete with 5,000-chip starting stacks, twelve-minute blinds and unlimited re-entries. “It’s great having unlimited re-entries because it allows you to buy back into the tournament, effectively starting from scratch as if you are a completely new player and given the same starting stack you got when you first entered,” read a statement from Intertops Poker. 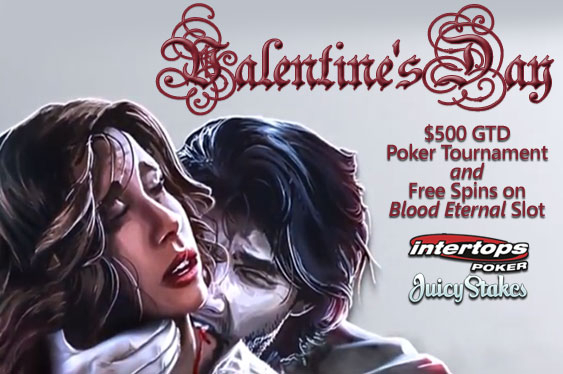 For the online video slot fan out there, the pair will additionally mark Saint Valentine's Day by offering 20 complimentary spins on the six-reel and 30-payline Blood Eternal title from developer BetSoft Gaming Limited. To take advantage of this special promotion, players should enter the coupon code ‘BLOOD ETERNAL’ although the offer is to come with a $250 maximum prize provision that can only be claimed once it has been rolled over at least 30 times on the sites’ other many games from BetSoft Gaming Limited. “Vampire symbols only appear on reels two and five and humans only appear on three and four,” read a statement from Intertops Poker.